From this vantage point, the future of the American church looks pretty dire--desperate even. I'm no expert on the details, and my point here isn't to argue all the reasons for why we should be worried about it, but the image of large sanctuaries with too many empty seats--continuing to thin-out even further as time moves on--is haunting. 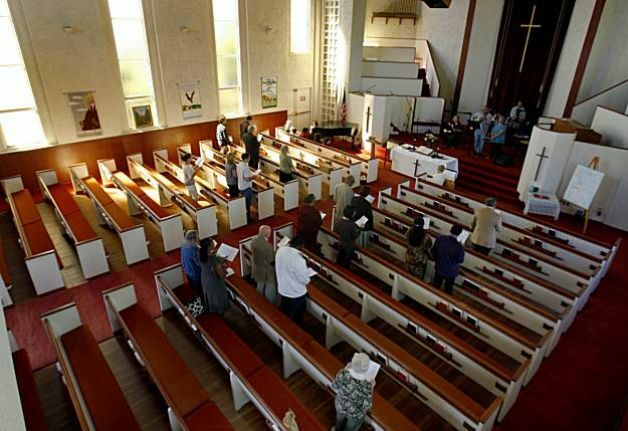 Congregations are shrinking. Budgets are withering, positions are being cut, and there's no empirical evidence to support the assumption that the generosity of the emerging generations will live up to the standards set by their predecessors to fund the jobs that seminarians expect to exist for them after graduation. Some churches are growing, but signs are suggesting that growth is fleeting and that the monster of death which surrounds the church will eventually find its way to the doors of every church--even the ones with rock-star communicators pounding the pulpits and hipster worship bands rocking the alters. We need to stop and let it settle in--we don't know that there's a future for us. If we're not honest about that, we risk not only death, but death in deception. One thing is sure - if the church is going to survive, things have got to change. We're at a crossroads. If we're going to survive, we've got to get creative about how we "do" church, how we think about the church's mission, how we connect with people, and how we think about the resources we have. We've got to figure out how to tap into the spiritual fervor of emerging generations... churches aren't shrinking for lack of interest in spiritual matters. In fact, the signs all suggest that people are as spiritually engaged as ever. But the church, with all the baggage of Christendom and Constantinian institutional establishment, isn't the outlet people are choosing for the exploration of those spiritual interests. The survival of the church coincides with its ability to communicate the depth and beauty of the gospel of Jesus in a way that's fresh and inspiring enough for people to be caught by it. But survival isn't the only thing for us to consider. We have to consider, first and foremost, what it is that God is actually doing in our midst. Ministry isn't about survival, it isn't about necessity, it's about joining in the ministry of God in the world. The church has a nasty habit of doing things out of necessity rather than out of the conviction that their means are the best possible way to participate in what God is already up to in their midst. And when we do things out of necessity, they often stink like conformity. Even if the means are effective, they often produce something short of what's actually faithful to God's mission. Faithfulness should be considered before effectiveness. In fact, effectiveness isn't really our job. Ends, as such, are not our job. Ends are God's job. History is God's job. Effectiveness is God's job. Our job is obedience. Our job is means. Our job is faithfulness. Our job is not effectiveness, our job is to imitate God in a way that is faithful to who God is in the world in which we live. This is the gospel of grace. While the future looks pretty dire indeed. When we put things into perspective, worry is not the proper response. The proper response is not anxiety. Such is the operation of works-righteousness--the presupposition that we must work for our own ends and that our future will be dependent upon the merit of our own work. But the gospel of grace tells us that our ends are graced by God, and the proper response to grace is the response of creative participation in the ministry of the God who promises our good. Our culture is the victim of a church which has too often forgotten how to respond to grace with gratitude and creativity. So here's the encouraging part: while the future looks dire, there is no shortage of creative and thoughtful people in the emerging generations of the church. As a student at Princeton Seminary, I have the privilege of sharing space with many people who will lead, vision, and minister to the church in the future. I'm constantly humbled by the depth and creativity of some of these people. There're at least a few people here with whom I'd go to war (metaphorically speaking of course)--people who leave no doubt that the church has a future as long as they're a part of it. It's not just in the seminaries... I'm constantly humbled by the conversations I have with people who are working in churches and youth ministries - volunteers and pastors. In the churches and in the seminaries there is an energy bubbling just beneath the surface as people begin to ask the questions with which the church is faced. There's hope, there's definitely hope, even in the uncertainty we face. I'm confident that the church is gonna make it... however, the question remains: will we survive for survival's sake, or will we respond to God's grace and participate in what God is doing in such a way that the church will be worth its survival?